Wow! B Greyble (i.e. Betty Grable) is going to make someone VERY HAPPY!! If you are breeding for grey this one is one not to miss. Her maternal brother is standing as lead GREY herdsire at Timberview alpacas and producing fantastic grey crias. Look at the names in this pedigree. The sire’s side boasts 6PERUVIAN DOM TIMBO 5042 IMPR98 as her grandsire. Her sire Dom Savone took 3rd at the 2002 National Show. Nice! B Greyble’s dam is Irish Meadows Bonnie Beth a GREY daughter of the legendary CPeruvian Accoyo Express 002, winner of numerous get of sire competitions. Known for his ability to produce superior, consistent, show quality offspring. Bonnie Beth herself has brought home second and third place ribbons in major shows. Bonnie has only delivered 3 times, each time an exceptional alpaca. She has produced two greys and one true black. The eldest is True Black “Gris” who sold at the 2015 American Alpaca Showcase auction for $5,000, and she produces grey! Bonnie’s second cria is WBAF PERUVIAN CASANOVA’S COWBOY a beautiful GREY who took home First place at the 2011 I-80 alpacafest and has several other ribbons to his name. And her final cria is our one and only B GREYBLE! In our humble opinion, saving the best for last! B Greyble has been awarded 1, 2 and 3rd at large competitive shows. Density and Consistency are her trademarks along with heavy bone, fantastic phenotype and perfect bite. We LOVE B Greyble but our little pasture is getting full. Our farm is TINY and we are expecting 3 cria this summer. After a lot of thought we felt that B Greyble would be a great addition to a farm wanting to breed for show quality grey alpacas. She has a deep, dark and dense rose-grey fleece. We’ve had requests to buy the fleece MONTHS before she is even shorn. She will make a very interesting addition to anyone’s herd. “B” is the first to greet guests and will delight in any carrots you’d be willing to share. She completely does not respect your personal space, which is fine with us, making her incredibly interactive and really the life of the party. 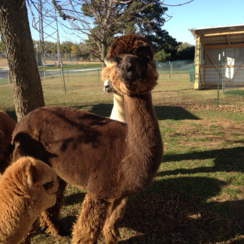 She is bred to Mr. Big at Timberview Alpacas, a very stylish young male with extremely consistent fleece characteristics. He has produced some beautiful babies. We are expecting a lovely dark brown/bay black cria or perhaps a dark rose grey when these two are paired. The purchase of B Greyble includes a drastically reduced rate, and reserved slot, breeding to any of our herdsires. We do not believe in including a “Free” breeding as this encourages farms to restrict their thinking on their own farm goals. If our males fit with YOUR goals, then the purchase of B Greyble also includes a transferable, reduced rate ($250) breeding to any of our herdsires, INCLUDING MALES THAT ARE RESTRICED. This is valid for as long as we are in business. 25% down. Remainder payable in 4 equal installments over one year. Registration will be released once paid in full.